As Sorrow is the tallest peak in the Wrothgarian Mountains, the ancient Orcs of the early First Era used its heights as a burial ground for their chiefs and champions—the mightier the chief, the higher the Orcs placed his tomb. 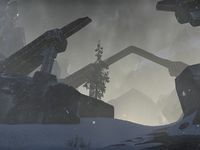 Sorrow is a mountain found east of Fharun Stronghold. Sorrow Objective: Help Lady Laurent climb to the top of Sorrow. Awaken the Past: Seek out relics to fill the museum of the Orsimer.